[CIVIL WAR]. CHARLES E. WALBRIDGE. 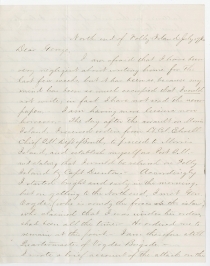 Autograph Letter Signed, to “George,” July 17, 1863, Folly Island, South Carolina. 5 pp., 7¾ x 9¾ in. I am afraid that I have been very negligent about writing home for the last few weeks, but it has been so because my mind has been so much occupied that I could not write; in fact I have not read the newspapers. I am having more leisure now however. 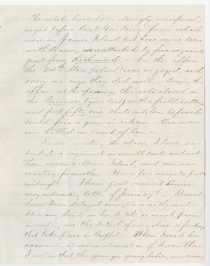 The day after the assault on Morris Island, I received orders from Lt. Col. Elwell Chief Q. M. Dept of South, to proceed to Moms Island, and establish myself as Post Q. M. and stating that I would be relieved on Folly Island by Capt. Dunton. Accordingly I started bright and early in the morning, but on getting to the North end, I met Gen. Vogdes (who is comd’g the forces on the island) who claimed that I was under his orders & had been all the time. He ordered me to remain at this point. I am therefore still Quartermaster of Vogdes Brigade. The rebels have been strong reinforced; night before last, Gen. Terry’s forces which were on James Island but have since been withdrawn, were attacked by five regiments just from Richmond. In this affair the 54th Mass. (colored) was engaged, and every one says they did well. During the affair, at the opening, the Rebs opened on the Pawnee (gunboat) with a field battery, and put fifty one shots into her, before she could fire a gun in return. One man was killed on board of her. Since writing the above, I have embarked a regiment in small boats, and sent them across to Morris Island, and am now waiting for another. It is a few minutes past midnight. I have just received Louise’s very interesting letter of June 27th. It must have been delayed someplace on the road. It is very kind in her to take so much pains in writing me the details of every show or fandango that takes place in Buffalo. When I read her accounts, it seems almost as if I were there. I notice that the younger young ladies are coming <4> on the field of action; those who were little girls not very long ago. I received your Leslie. The camp represented in the fiction of the Observatory was not mine. My camp was about a mile from it. I was paid off a few weeks ago, but I was so busy, that I just slapped the money into my wallet & did not think anything about sending it home. It is so long now that I think I will wait till next pay-day, and send it all together. I cannot but think constantly of the approaching battle tomorrow; just think if we get Charleston! Vicksburg is fallen, Richmond at our last accounts was seriously threatened, Lee was in chancery up in Maryland, and now if we can only take this accursed city. I believe that we have as good troops here, as ever were any where, and I have great faith in Gillmore, Seymour, Strong, & Terry. Vogdes remain on Folly Island. That regiment hasn’t made its appearance, and I am getting sleepy so good night. 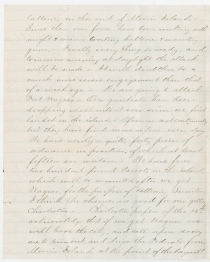 While onboard the steamer Cahawba on January 28, 1863, Charles Walbridge wrote to his brother, “We are still in the dark as to our destination. My opinion is that it is not Wilmington. I think that it is nothing less than Charleston. Wouldn’t that be a big thing?” Their destination was indeed Charleston, and Walbridge spent the next several months on Folly Island and Morris Island south of the entrance to Charleston harbor. 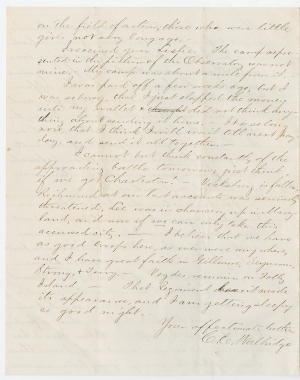 Walbridge wrote this letter on the eve of the Second Battle of Fort Wagner, made famous by the participation of the 54th Massachusetts Regiment. In addition to the 54th Massachusetts, the first brigade consisted of the 6th Connecticut, 48th New York, 3rd New Hampshire, 76th Pennsylvania, and 9th Maine regiments. The second brigade consisted of the 7th New Hampshire, 62nd Ohio, 67th Ohio, and 100th New York regiments. 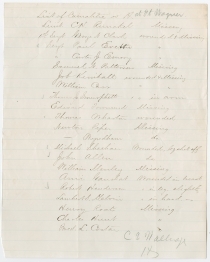 The attached list of casualties are men from Company H of the 100th New York regiment wounded or missing in the Second Battle of Fort Wagner on July 18, 1863. They are among the approximately 1,500 casualties sustained by the Union forces, compared to only 174 casualties for the Confederate defenders. 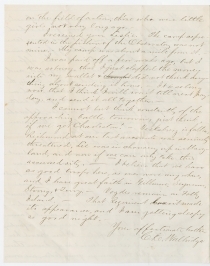 In a letter to his brother on July 29, Walbridge wrote, “We have not heard a word from Runckel or Clark, my orderly sergeant. I fear they are both dead.” Walbridge’s fears were correct; both Lieutenant Charles H. Runckle and Sergeant George N. Clark were killed in the attack on Fort Wagner on July 18. Job Kimball, Edward Townsend, Newton Piper, Daniel H. Wyndham, Henry Roats, Charles Hunt, and Frederick L. Coster were all also killed in action on July 18. Samuel M. Patterson was captured on July 18 and died in prison at Richmond on April 5, 1864. William Carr and John Allen were wounded, and both were discharged on February 14, 1865. John S. Smurphet was wounded and died of typhoid fever at Beaufort, South Carolina, on September 8, 1863. Michael Sheehan was discharged for his wounds on February 2, 1864. William Manley was wounded and captured; he died of his wounds the next day, July 19, in Charleston. Ami Gauchat was wounded and mustered out on June 25, 1865, from the hospital at Fortress Monroe, Virginia. Although Union troops failed to seize the fort in the Second Battle of Fort Wagner, the performance of the 54th Massachusetts regiment improved the reputation of African Americans as soldiers and inspired greater recruitment of African Americans into the Union Army. After a Union siege of the fort, the Confederates abandoned it on September 7, 1863. Charles E. Walbridge (1841-1913) was born in Buffalo, New York, and worked in a hardware company. In September 1861, he enlisted in the 100th New York Volunteers and was made a second lieutenant in Company H. Promoted to second lieutenant in July 1862 and to captain in January 1863, he served with the regiment until 1864. In February 1864, President Lincoln commissioned him as an assistant quartermaster of volunteers with the rank of captain. In February 1865, he was brevetted major and soon appointed chief quartermaster of the 10th Army Corps, with the rank of lieutenant colonel. At the end of the war, he purchased surplus mules, horses, and wagons from the army and sold them to southerners affected by Sherman’s march. In 1866, he returned to Buffalo, and in 1869 opened his own hardware business. He married Annie F. Noble of Brooklyn in 1868. George B. Walbridge Jr. (1844-1885) was born in Buffalo, New York. By 1860, he was already working as a clerk in Buffalo. In 1870, he was a commission agent, living in Brooklyn. He died in Plainfield, New Jersey.